Keep your jewelry collection organized and beautifully displayed with this set of 3 charming jewelry racks. 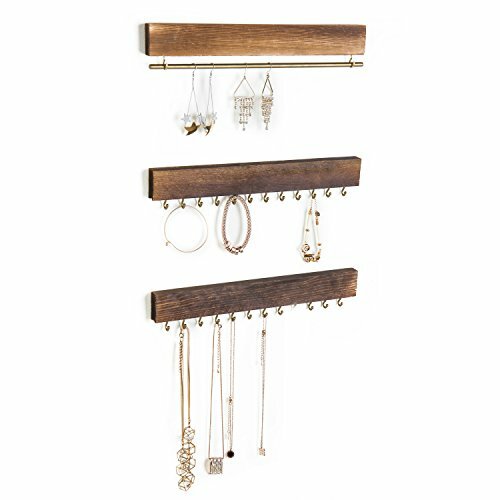 Each wall-mounted jewelry organizer in this set features a strip of wood with a rustic-style finish that adds some vintage charm to your space. One of the jewelry racks comes with a gold-tone metal bar that is ideal for holding hook-style earrings, while the other 2 jewelry hangers boast gold-tone metal hooks that can be used to store and display necklaces, bracelets, and more. Simply attach these decorative jewelry organizers to any wall in your home or store using the appropriate mounting hardware (not included), and you'll have a stylish and sensible way to keep your jewelry both stored and displayed. Approximate Dimensions (each hanger, in inches): 12.25 W X 2.25 H X 0.5 D.
A set of 3 wall-mounted jewelry organizers made of wood with a rustic-style finish. One of the organizer racks features a bar designed to hold hook-style dangling earrings. The other 2 organizer racks each come with 12 hooks for holding necklaces, bracelets, and more. If you have any questions about this product by MyGift, contact us by completing and submitting the form below. If you are looking for a specif part number, please include it with your message.